BEIJING – China knows less about and has less influence over its close ally North Korea than is usually presumed and is likely to eventually accept a reunified peninsula under South Korean rule, according to U.S. diplomatic files leaked to the WikiLeaks website. The memos — called cables, though they were mostly encrypted e-mails — paint a picture of three countries struggling to understand an isolated, hard-line regime in the face of a dearth of information and indicate American and South Korean diplomats’ reliance on China’s analysis and interpretation. The shelling comes on the heels of a slew of other provocative acts: An illegal nuclear test and several missile tests, the torpedoing of a SouthKorean warship and, most recently, an announcement that in addition to its plutonium program, it may also be pursuing the uranium path to a nuclear bomb. The memos give a window into a period prior to the latest tensions, but they paint a picture of three countries struggling to understand isolated and unpredictable North Korea. In the cables, China sometimes seems unaware of or uncertain about issues ranging from who will succeed North Korean leader Kim Jong Il to the regime’s uranium enrichment plans and its nuclear test, suggesting that the North plays its cards close to its chest even with its most important ally. Questioned about the enriched uranium program in June last year, Chinese officials said they believed that was program was “only in an initial phase” — a characterization that now appears to have been a gross underestimate. China is Pyongyang’s closest ally — Beijing fought on the northern side of the Korean War and its aid props up the current regime — and its actions have often served to insulate North Korea from foreign pressure. It has repeatedly opposed harsh economic sanctions and responded to the latest crises by repeating calls for a return to long-stalled, six-nation denuclearization talks that the North has rejected. But China would appear to have little ability to stop a collapse and less influence over the authorities in Pyongyang than is widely believed, South Korea’s then-vice foreign minister, Chun Yung-woo, is quoted telling American Ambassador Kathleen Stephens in February. China lacks the will to push Pyongyang to change its behavior, according to Chun, but Beijing will not necessarily oppose the U.S. and South Korea in the case of a North Korean collapse. China “would be comfortable with a reunified Korea controlled by Seoul and anchored to the US in a ‘benign alliance’ as long as Korea was not hostile towards China,” Chun said. Economic opportunities in a reunified Korea could further induce Chinese acquiescence, he said. The diplomatic cables warn, however, that China would not accept the presence of U.S. troops north of the demilitarized zone that currently forms the North-South border. Chinese Foreign Ministry spokesman Hong Lei said China would not comment specifically on the cables. “China consistently supports dialogue between the North and South sides of the Korean peninsula to improve their relations,” Hong said at a regularly scheduled news conference. In the leaked cable, Chun predicts the government in Pyongyang would last no more than three years following the death of ailing leader Kim Jong Il, who is seeking to transfer power to his youngest son Kim JongUn, a political ingenue in his 20s. Chun also dismisses the possibility of Chinese military intervention if North Korea descended into chaos. Despite that, China is preparing to handle any outbreaks of unrest along the border that could follow a collapse of the regime. Chinese officials say they could deal with up to 300,000 refugees, but might have to seal the border to maintain order, the memos say, citing an unidentified representative of an international aid group. Chinese officials are also quoted using mocking language in reference to North Korea, pointing to tensions between the two neighbors in contrast to official statements underscoring strong historical ties. Then-Deputy Foreign Minister He Yafei is quoted as telling a U.S. official in April 2009 that Pyongyang was acting like a “spoiled child” by staging a missile test in an attempt to achieve its demand of bilateral talks with Washington. U.S. Secretary of State Hillary Rodham Clinton said Monday that WikiLeaks acted illegally in posting the leaked documents. Officials around the world have said the disclosure jeopardizes national security, diplomats, intelligence assets and relationships between foreign governments. Five international media organizations, including The New York Times and Britain’s Guardian newspaper, were among those to receive the documents in advance. WikiLeaks is also slowly posting all the material on its own site. The US has confirmed it will hold naval exercises with South Korea, after a report blamed the North for the sinking of a Southern warship, officials say. The Pentagon said the joint anti-submarine and other military exercises would start “in the near future”. South Korean President Lee Myung-bak earlier froze trade with Pyongyang, vowing to punish those who carried out the attack. North Korea has said it will retaliate for any action taken against it. The country’s main newspaper called the investigation an “intolerable, grave provocation”. 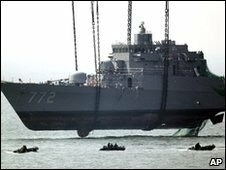 South Korea has said it will refer the North to the UN Security Council in response to the sinking of the Cheonan – and the resulting death of 46 sailors – in March. In a move endorsed by the US, President Lee said in a televised address that Seoul would no longer tolerate “any provocative act by the North and will maintain a principle of proactive deterrence”. Analysts describe the joint exercises as a statement of US commitment to help Seoul rather than an attempt to intimidate Pyongyang.Pentagon spokesman Bryan Whitman said the decision to start joint naval exercises was “a result of the findings of this recent incident”. US Secretary of State Hillary Clinton said earlier that her country was working hard to avoid an escalation. After talks in China, she urged countries in the region to contain “the highly precarious situation created by North Korea”. China – North Korea’s closest trading partner and a permanent member of the Security Council – has urged “restraint”. Japan said it was contemplating its own sanctions on Pyongyang. The North depends on South Korea and China for up to 80% of its trade and 35% of its GDP. In 2009, inter-Korean trade stood at $1.68bn (£1.11bn) – 13% of the North’s GDP. The BBC’s John Sudworth in Seoul says the measures are as tough a response as the South could take short of military action. They reported that parts of the torpedo retrieved from the sea floor had lettering that matched a North Korean design.The measures came less than a week after experts from the US, the UK, Australia and Sweden said in a report that a torpedo had hit the Cheonan. Pyongyang denies any involvement in the sinking, calling the investigation a “fabrication” and threatening war if sanctions were imposed. “If [South Korea] sets up new tools for psychological warfare such as loudspeakers and leaves slogans for psychological warfare intact, ignoring our demands, we will directly aim and open fire to destroy them,” a statement by the military said on Monday. “More powerful physical strikes will be taken to eradicate the root of provocation if [South Korea] challenges to our fair response,” said a commander, according to official news agency KCNA.